The 1992 album official vinyl reissue for this year’s Record Store Black Friday on November 24. The release is limited to 5000 copies. So why is a Harvest Moon so special to Neil Young fans? 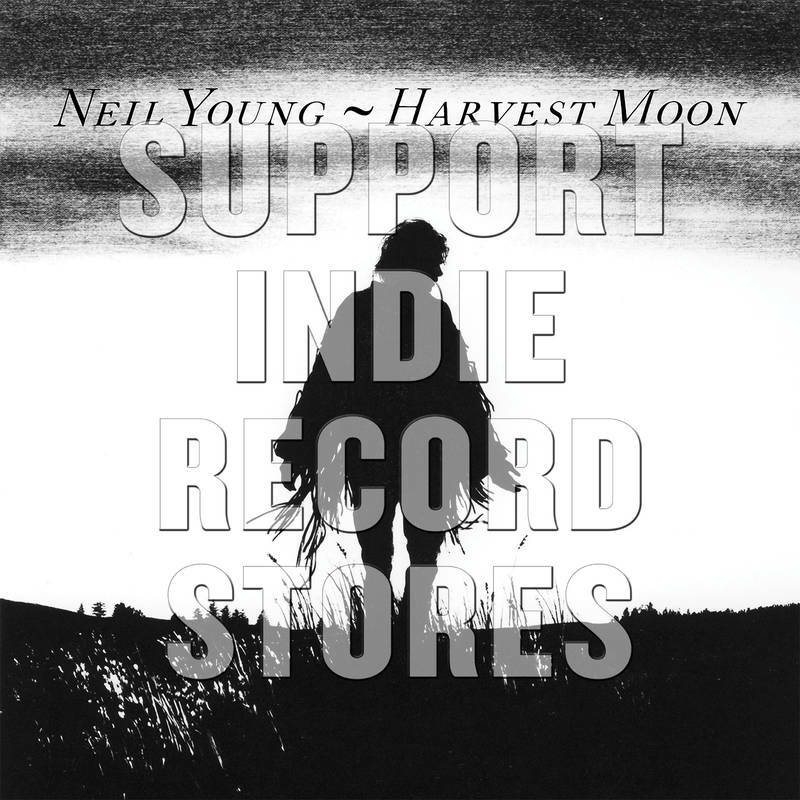 Many may recall back in 2008, when Steve and his girlfriend Danielle made a request for "Harvest Moon" to played when Neil Young visited Brisbane, Australia. And by some extremely wonderfully little miracle, Neil Young actually did perform "Harvest Moon" that night and it brought a tear of joy for many around the world. Then in 2009, Gavin in Ireland Requested "Harvest Moon" in memory of his father. Wish granted. And shortly thereafter, another Wish for "Harvest Moon" was Granted to Liza in Germany. So we here at Thrasher's Wheat hold the song and this night very dearly. 3 fans that we've never met, on 3 continents touched by Harvest Moon magic. We know that some of you may not understand. Some instructions for best viewing: "Keep an eye on the Moon as it creeps above the eastern skyline. The golden orb may appear strangely inflated. This is the Moon illusion at work. For reasons not fully understood by astronomers or psychologists, a low-hanging Moon appears much wider than it really is. 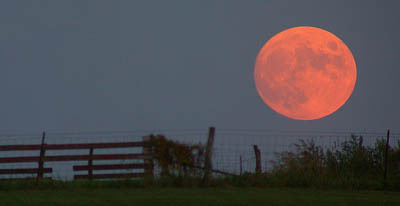 A Harvest Moon inflated by the moon illusion is simply gorgeous." Reviews of Neil Young's Harvest Moon. Review: Neil Young's Dreamin' Man - A live "Harvest Moon" album. "Harvest Moon is the quintessential down-home-mom's-apple-pie American folk album. It's one of the few Neil Young albums that you can share with the one you love, along with a bottle of something nice, without having to apologetically hit the fast forward button or move the tracking arm forward. "In my opinion, there is not a single cut on 'Harvest Moon' that does not sound better in its 'original state: solo acoustic. Neil has always said he prefers simplicity. Always the advocate of live recording whether it be in the studio or the concert hall, Neil has always been able to capture the essence of his music at its most spontaneous. There is nothing on 'Harvest Moon' that strikes me as spontaneous...or even close. It is the kind of slick, overly produced product that record companies dream about. Reprise must certainly be happy with it. With its heavy country sound, 'Harvest Moon' arrives just in time to (hopefully) capture a share of the market in the current country/western music fad/phase we seem to be in the midst of. " "'Harvest Moon' is often regarded as the follow-up to 'Harvest' but I hardly think it is a clear-cut affair. It is less ambitious in its scope (after Young's genre confusion in the eighties) but its modesty is also the key to its success. I guess the fact that the Stray Gators return to the fore echoes 'Harvest' but the arrangements on here are mainly acoustic based and only at times sound like his unfairly critically savaged watershed release. 'Comes a Time' is a more accurate comparison, if you ask me, although the musical themes on this album are more varied. The songwriting is certainly as strong as Comes a Time although not every song is a veritable masterpiece." 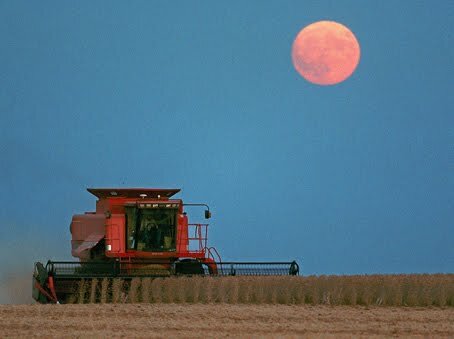 "The 'simple man' image of Harvest Moon may become a tad overplayed at times -- especially on songs like 'Dreamin' Man' and 'One Of These Days' -- but it never seems to become overbearing. Neil Young often misrepresents himself as a plain man, but this album proves his more simple approaches to songwriting can often yield his most perfectly enjoyable results." "Simplicity has always been one of Young's greatest strengths and weaknesses, so while he occasionally merely re-creates the moon-eyed dreamer of yore, he has surrounded his meditations in some of his simplest, most gorgeous melodies in years. This is Young taking stock, recalling old friends in One Of These Days, paying tribute to a departed hound in Old King and apparently re-evaluating his marriage in a succession of heartwarming, sometimes troubled love songs. Best of all are the opening Unknown Legend and the title track, tender shuffles with celebratory choruses that rekindle old flames while acknowledging the passing of time. Nostalgia is often the last resort of scoundrels but Harvest Moon is ultimately not content to be Harvest 2, even as it re-affirms and re-examines Young the naif romantic, still dreaming after all these years." "Harvest Moon, on the other hand, is a chronicle of survival, focusing on loss and compromise and the ultimate triumphs of being a married father approaching fifty. It's full of bittersweet tributes to lost friends, dead hounds and love grown old. 'What this album is about is this feeling, this ability to survive and continue and grow and get higher than you were before,' says Young. 'Not just maintain, not just feel well. Not just 'I'm still alive at forty-five.' You can be more alive.'" Also, here's a collection of album reviews and commentary of Neil Young's Harvest Moon. 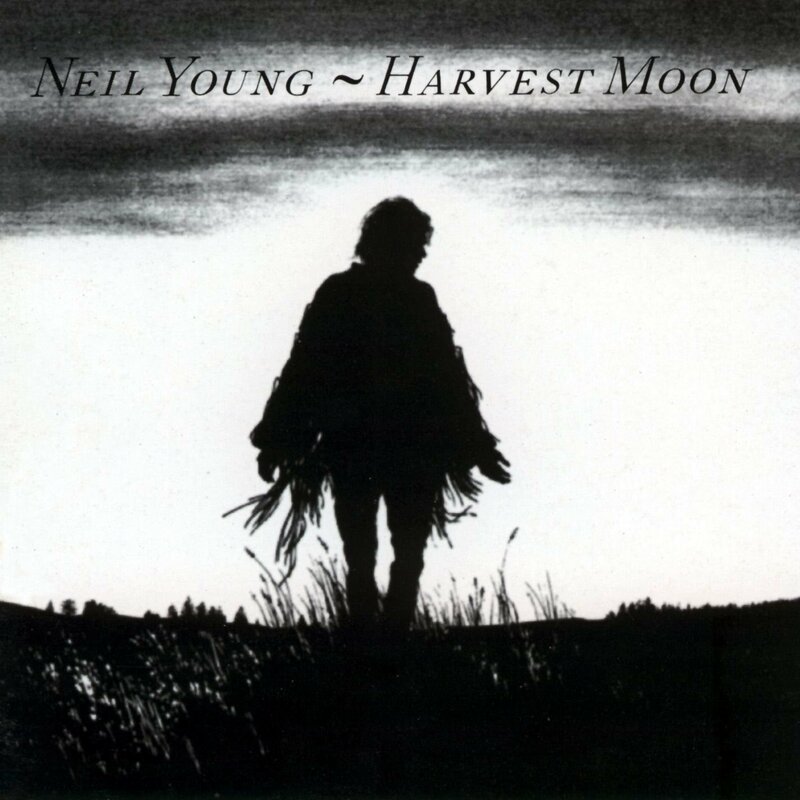 Track list, MP3 samples, and more details @ Neil Young's Harvest Moon. Also, see the ZUMA payload post in the context of black Fridays, black budgets, Black Balloon Productions, EMP black-outs, BLM and other "black" days. Have a Merry Black Friday to all!!! Do we think this will be officially rereleased outside of Record Store Day? I stand no chance of scoring a copy of this. Harvest Moon to be released as a 2 LP RSD FIRST on Black Friday November 24th. This means that it will initially be only available at independents but at some point Later in time will be available to all internet and retail outlets. The reissue of Decade LP was handled in the same manner. My question is how can this be a 2 LP reissue. Hopefully there will be some outakes from the original sessions (perhaps Silver and Gold) to fill out the two records. The original pressing along with the German Pressings were 1 LP. 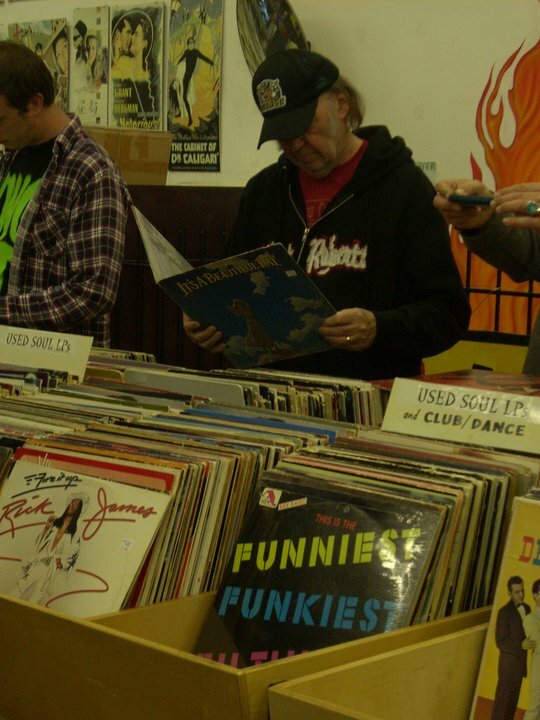 Maybe the info on the record store day website is wrong. They list it as a 2 LP set. Uh oh. Look out Tbone Talker is in the house. Same tall stories new name. Joseph, I bet they went with 2LP for optimal vinyl pressing. It will cost an arm and a leg, but at least will be readily available. That album was recorded in high quality (wasn't it digital?) so it merits a proper release in optimal quality... as Neil is wont to do. Put me in the "meh" column vis-à-vis "Harvest Moon." As one of the reviewers said, it's far too overproduced and slick. Would be much better were it a stripped down affair, link Harvest or Comes a Time. A 2 LP vinyl version - meaning 45 rpm, no doubt, and getting up to flip it every 10 minutes. No thanks. With the Box set that was released on record store day two years ago it was labeled as a numbered limited edition, yet none of them had a number. You could only get a numbered copy from the web site store. Decade was numbered last RSD, but the later release was not. As far as numbered editions go, It's cool but not necessarily that important to me as long as I can own the music. I buy music to hear it, not to collect it. So as long as Harvest Moon can be purchased by everyone who wants it, I don't care if it has a number embossed on the cover. The songs are on three sides. The fourth side is etched.